“How did the booze job go? I hope you got me a tidy profit out of that, Enrico”. “Boss, I’m sorry, but when we arrived there Traitor Tony’s boys where just leaving with a damned truck full of bottles, we just got ten grand worth of bourbon out of it”. The Boss sighed heavily. Traitor Tony had cut into his profits any way he could these last few weeks. “Alright, Enrico. It’s not your fault. I don’t blame you. So here’s what you will do: you will take some of the guys, and then you’ll drop by Tony’s warehouse down on 42nd and get me that booze back”. Enrico was shifting uncomfortably. “What do you mean? Take Ricky the Rat, John Marlone and Heinous Harry and …”. “Ricky’s in jail, John has not shown up today, but people say he has a new girlfriend, and Harry is in hospital and the doctors are still not sure”. The Boss’s $200 cigar fell to the ground as he bit off the end in rage. It’s Prohibition time, and everyone knows that there is no better way to boost alcohol profits than to make it illegal. So go out into the streets and profit, the money’s just lying around waiting to be picked up by someone who doesn’t consider laws to be mandatory. In other words, someone like you, at least in Heiko Weyen’s first and Kompass Spiele’s second game MafiaDollar. Just like you’d expect in a Prohibition era game, everything is about booze and hookers, with a side-order of tobacco and gambling. That’s the four areas of “business” you can get involved in, represented by four piles of loot cards in the middle of the table. You start out as the head of an organization that can’t even be called a gang for lack of gangsters. All you have is a warehouse in a seedy part of town and, with some luck, at least one gangster wanting to join your budding empire of crime. MafiaDollar is a classic card game and your turn starts in the same way it has started in thousands of other games before: you draw a card from the pile, and then you play a card from your hand. A slight difference to the usual draw-and-play rule set is that any loot card you draw immediately goes to the appropriate pile in the center of the table and you draw another card to replace it. However, the game only really starts after you played your first Gangster card. Once you have a gangster in play, you can perform gangster actions as a third step on your turn. All gangsters start out in your Hideout, the play area directly in front of you. The only action a gangster in your Hideout can take is to go out in the Street – you push the card forward – in preparation of future crimes. Al Capone’s Pro Tip: commit crimes outside your own Hideout, not inside. The number of actions you may perform is the number of Gangsters or Warehouses you own, whichever is lower. But no Gangster may ever perform two actions on one turn, so your boys have to stay out in the streets for at least one round before they come back with money for you. The easiest way to get rich is to participate in the various illegal activities going on in the center of the table. As an action, a Gangster can take the top card from one of the four loot piles and return to the Hideout with it – after any criminal activity, your boys always return to the hideout. Bad luck if the top card was a measly $5.000 and you just revealed a $50.000 for the next player to pick up. 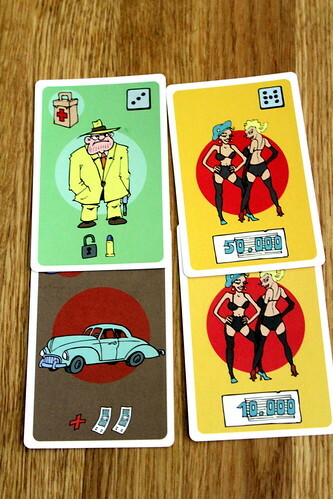 To avoid that embarrassment, you can equip your Gangsters with a Car card that lets you take one to three additional cards, but only from the same pile. Al Capone’s Pro Tip: always spring for the bigger trunk. The looted cards disappear in the relative safety of one of your warehouses. But sooner or later you will find yourself with no good cards to loot on the table, looking at an opponent’s warehouse that is so full of loot that bourbon bottles keep tumbling out of an upper floor window. Or you’ll just find yourself with an inexplicable thirst to ruin someone’s day. Then it’s time for more direct action. Breaking into said warehouse, for example. The mechanism to break in is rather easy: each Warehouse has a value of eight, nine if a Guard Dog card is attached to it. When you try to break into a Warehouse you draw a card from the deck and the die depicted in the upper right corner shows your success, from one to eight. To that you add the number of padlock symbols your Gangster card shows, plus the padlock symbols from burglary tools your Gangster is – hopefully – carrying. If the total exceeds the warehouses value, you may look through the loot cards under that Warehouse and keep one of them. Al Capone’s Pro Tip: watch where the opposition is taking their loot, nothing is more embarrassing than breaking into an empty warehouse. Memory is a useful skill in MafiaDollar: you want to know what’s in your opponents’ warehouses and where the good loot cards are buried. “Tony will have to go. Take these lead pumps down to the docks. Tell El Colombiano he can have them if he goes and daylights some of Tony’s boys with them”. “Are you sure that’s wise boss? The Colombians are pretty desperate right now, they have no many, no gear, no nothing. Giving them guns, there’s no telling who they’re going to hit”. “We’ll deal with the Colombians when they become a problem. For now, Tony is the problem”. And sometimes, even more direct action is justified. That Gangster with a total of six padlocks doing the shifty eyes towards your warehouse? It’d be a shame if something happened to him wouldn’t it? It’d be more of a shame if your guy missed, actually. Killing an opponent’s Gangster works the same as robbing a Warehouse: you draw a card, this time add the Bullet symbols from your Gangster and his equipment, and if the number exceeds eight your target gets a Chicago overcoat and is discarded. As an added bonus, you may pick up his equipment. There is no way to protect a Gangster from being shot, no equivalent to the Guard Dog – the only way to keep your boys safe is to keep them in the hideout, only Gangsters on the street can be killed. Keeping a Six-Bullet-Gangster in the street ready to shoot is a good way to keep the streets calm as anyone in the street is a potential target. But nothing is without a counter and there’s an easy way to put any Gangster on ice for a while: Block cards. These purple cards come in four types as well: Beat Up, In Jail, At Home or Girlfriend. All make the affected gangster unable to do anything until his Boss plays a card with the appropriate symbol on it. A Gangster can be affected by any number of Block cards at the same time and they have to be removed from top to bottom then. A gangster can even be in the dreaded Double-Jail: so deep in jail that when he breaks out of jail he’s still in jail. Of course, your opponent might just have the right card to get his Gangster out anyway, and then still shoot you. Al Capone’s Pro Tip: don’t rely on the opposition to be unprepared. Even worse, your opponent might remember something that we tended to forget in our first games that makes MafiaDollar much more fun: you may trade cards with other players. Even if your Gangster is the most dangerous element on the street, you can always find someone to help you get him out of jail in exchange for a new truck. Trading is just mentioned in a short paragraph of the MafiaDollar rules, but for me, it makes the game. Without it, MafiaDollar is a slightly tactical card game with a high amount of luck, but if you remember that trading is an option, things start to become interesting. Especially with four or more players – the more players the better, the rules allow for up to six, but there is no good reason not to play with seven or eight. I wouldn’t recommend playing in two players, not much fun there. Three players works, but more is definitely better. Not only for the trading, but also for a bit of meta-gaming the rules don’t mention but that goes perfectly with the rules and the setting: making and breaking alliances. You can’t make an alliance to win together, but you can come to an agreement to keep a common enemy down, help each other out with cards, provide cover while your ally robs the current leader’s warehouse – and then shoot your partner in the back, take his equipment and rob his warehouse as well. That part is brilliant fun. Al Capone’s Pro Tip: do not play MafiaDollar without negotiating and backstabbing. To play like that, you need the right kind of players, of course. People that hold grudges are not a good match for MafiaDollar. Even playing our your dark side like this, there’s no denying that a big amount of luck goes into winning MafiaDollar, but at least you can have a ton of fun getting everyone mad at you.Especially – and this goes for the luck and for the getting people mad – when the Don has a birthday. 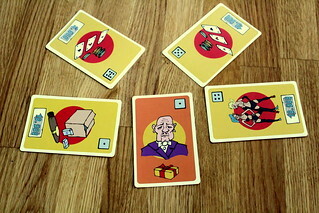 Playing the Don’s Birthday card, every other player has to give you one loot card from his warehouses. So much fun when you know that two people both have only a $50.000 card each. 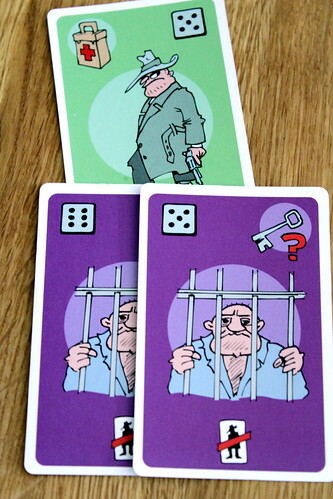 The game ends when the Prohibition ends, with a card that is shuffled into the last 30. At that point, the winner is the player with the most valuable loot, minus some penalties for active gangsters and warehouses as well as Police cards still in your hand. Especially Police cards hurt your profit margin if you didn’t play them before now. But playing them also hurts your profits, so your screwed either way. At least playing a Police card allows everyone to pass one card to the player on the left, giving you a chance to get rid of them. Only to receive more from your right, of course. Despite the luck needed to win, MafiaDollar is lots of fun. It’s a bit long to be considered a filler game, but if you’re in the mood to lightheartedly piss of some people, it’s a very good choice of game to spend an hour. Al Capone’s Pro Tip: Don’t forget to speak in Gangster slang and, optionallly, with a bad Italian accent, either. It enhances the mood. By the way, MafiaDollar comes as a bilingual edition in German and English. After weeks of war, Traitor Tony was finally down for the count. Things had been harsh, and for a while the Boss really hadn’t been sure if he would come out on top or not. But now Tony was here to pay his respects to the undisputed Godfather of the city. Life was going to be good. The Godfather was just taking a deep drag from his cigar when, hollering like a madman, El Colombiano stormed in. As it had turned out, El Colombiano’s gang consisted of El Colombiano. He had been a small if convenient distraction while the grown-ups had discussed the economy, but nothing more. And now here he was, a machine gun in his hands and a honest to god machete dangling from his belt, running towards them with a cry like a wounded mammoth. There was no telling whom he was going to shoot. Of course, that wouldn’t be an issue any more after he was perforated by both Tony’s and The Godfather’s bodyguards. He had just been a loose thread in The Godfather’s plan, and with him gone there was one less chance for everything to unravel. He took another drag from his cigar. The future looked pretty good right now.